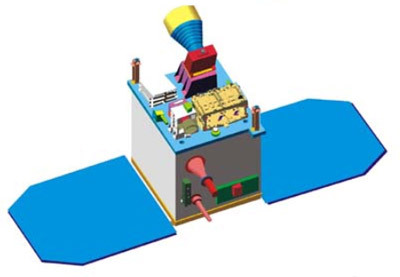 IMS-1 (Indian Mini Satellite-1), previously referred to as TWSat (Third World Satellite), is a small earth observing satellite developed by ISRO. Weighing 83 kg at lift-off, IMS-1 incorporates many new technologies and has miniaturised subsystems. IMS-1 carries two optical payloads – a Multispectral camera (Mx Payload) and a Hyperspectral camera (HySI Payload). Both Mx and HySI payloads operate in the visible and near infrared regions of the electromagnetic spectrum. The resolution of Mx camera is 37 meter with a swath of 151 km while that of HySI is about 506 meter with a swath of 129.5 km. The data from this mission will be made available to developing countries.